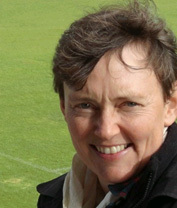 Lesley Green is deputy director of Environmental Humanities South. She is Professor of Anthropology in the School of African and Gender Studies, Anthropology and Linguistics at the University of Cape Town, South Africa, and was a Fulbright Fellow at the Science and Justice Research Centre at U C Santa Cruz in 2018. Her work focuses on the intersection of science studies, anthropology, philosophy and research methods in the Anthropocene. Her book on six fields of environmental management sciences in South Africa — Rock | Water | Life: Ecology and Humanities for a Decolonising South Africa — is currently in press with Duke University Press. Previous publications include Contested Ecologies: Dialogues in the South on Nature and Knowledge (HSRC Press 2013) and Knowing the Day, Knowing the World (Arizona University Press 2013).